March 19, 2015 by Ecommerce News. About Marketing with tags The United Kingdom. 5093 views. Digital retail group Shop Direct has turned one of its brands into a fully-personalized shopping experience. Online customers who visit the homepage of Very.co.uk will not only see their name turn up in a carousel image, but they will also see their interests reflected in the different parts of the homepage. 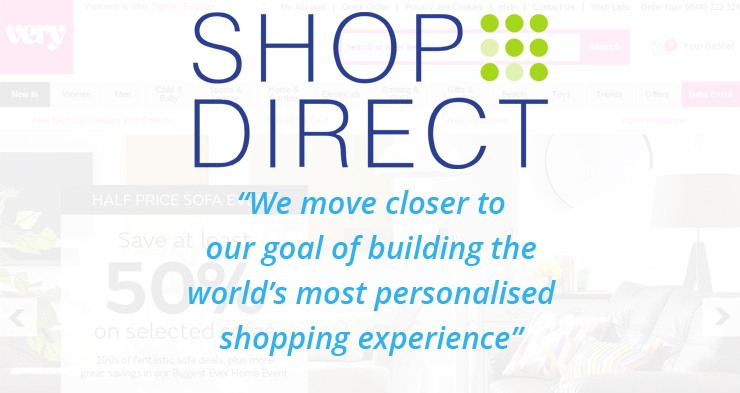 Shop Direct, a multi-brand online retailer in the United Kingdom and Ireland, believes this is a retail first. The company says the launch of a fully personalized homepage is a major step towards its goal of building the world’s most personalized digital stores. With the new homepage the retail group expecs to add over 28 million euros in sales in its current financial year. When a teenager has bought a party dress on Very.co.uk, the next time she will see her preferred fashion brands on display and the “women’s fashion” category will be presented more prominently. On the other hand, if someone is browsing the website solely because he wants to furnish their apartment, they will see more electricals and homeware offers. Shop Direct can serve about 1.2 million versions of the website to its customers. These versions are based on which of the website’s suite of promotional messages are used and in what position. Shop Direct will further innovate and experiment with this and it expects the number of different versions to rise to 3.5 million by the end of the year. Shop Directs use lots of customer data to achieve this. Its team of data scientists have developed a suite of complex algorithms to predict customer behavior and therefore optimize the homepage with targeted products and offers. The algorithm produces 200 million promotion affinity scores, which rank the relevance of offers for each customer. Shop Direct is really betting on personalization and its puts much effort in what it calls a “key part of the company’s growth strategy”. It already introduced personalized website navigation across all of its websites, using browsing behavior and purchase history to order the different product categories based on their relevance. Someone who regularly searches for items for the kids will be presented first with the “Toys” and “Child & Baby” categories, at the far left of the navigation panel. According to the retail group, it already has delivered a significant uplift in conversion and has added 7 million euros to the top line in its current financial year.